Wasn’t sure about this one – but I’ve yet to make something from The Superfood Diet that I don’t like and this sounded worth a try, especially given we had a spare mango kicking about just waiting to be forgotten and thrown out. I also had a spare chicken breast in the fridge left over from yesterday’s Tikka Massala. One thing I’ve gotten used to in the last six weeks is halving all the ingredients and only making enough for two. It’s all too easy to promise yourself you’ll make it last two meals but most things are too yummy and you just keep picking at the leftovers until they are gone. Not good for the diet. Oddly, we usually can’t even finish regular sized portions of late. I imagine that is down to the hot weather and being motivated to get this excess weight off! 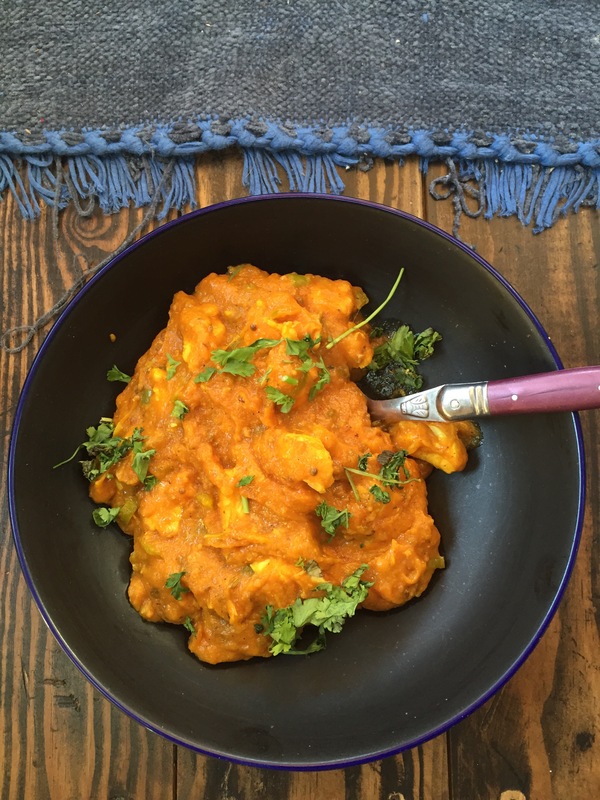 This dish is as easy as the Chicken Tikka Massala from yesterday. Toast some fennel seeds, nigella seeds, fenugreek seeds, and mustard seeds until the mustard pops and then fry off some garlic and ginger. I learned my lesson and eased off a bit on the ginger today. Freya was most pleased. To this mix you add turmeric and green chillies and a little asafoetida. I didn’t have any – and Brentford Morrisons isn’t the place to get it – so I did a quick Google and used onion salt as a substitute. Then add tomato purée and mango pulp. Bring to a simmer and add diced chicken. It’s ready in 30 minutes or so. I didn’t realise you could get mango puree in a can and manually prepped a really large mango instead – hedgehog prep style! I really liked this but we didn’t each much of it. Freya was a bit sad that she didn’t just get to eat the mango raw – it was super juicy – and some people struggle with getting their head round such sweet main courses. I thought it was great though; doubly good as mango is great at inhibiting the formation of fat cells. I had mostly leftover Tikka Massala from yesterday and we had a little snack of guacamole and pitta when we got in that just left us a bit full. The guacamole had to be done; we had two avocados just begging to go bad and I had spare limes, chilli and sour cream in the fridge. Seemed wrong to let them go to waste. Still. That’s tomorrow’s dinner sorted.